The current state of Overwatch’s Mercy might make for a disappointing World Cup tournament. According to a post on the Competitive Overwatch subreddit, her latest buffs are making games longer and a more boring event for spectators as easy resurrects counter big plays. Here’s all the Overwatch updates promised and planned for the near future. Mercy’s resurrection was recently moved from her ultimate ability, which players have to charge up over time, to her E, which is on a 30 second cooldown. Her new ultimate also provides an extra charge of this resurrect, and makes her able to fly and heal more effectively. She is easily the current best healer and support in the game, meaning both teams in every match will have one permanently. Because of that, any huge plays by the opposing side – tactical flanking pick offs, or good Widowmaker shots, for example – are fairly easily countered. This drags fights out and means less big engages, causing fights to take longer to even start, and leading to more boring games. You can see all the conclusions in the Reddit thread, which has also been posted on the main Overwatch sub. It’s interesting because each side having the same heroes and certain, very powerful characters defining the meta isn’t new for Overwatch. Genji’s ability to wipe a team with a series of skillful plays has been a long-standing norm. When Reinhardt was the strongest tank, starting fights was difficult due to the wall. Even before the Mercy patch we saw Zenyattas and D.Vas in almost every game. However, due to the nature of resurrect, taking out individual characters doesn’t have the same level of importance to it. If a DPS dies, Mercy can resurrect them with little adverse effect on the team, but if Mercy herself dies that’s the end of the team fight. It’s well worth sacrificing characters to get Mercy, leading to very odd game states. Whether this is terrible to watch is up to you, of course. Games are ongoing in the APAC Premier tournament currently, broadcast over on Twitch. Things still seem exciting to me, and featuring characters like Orisa and Widowmaker that are more rarely seen. Ana has been effectively replaced by Mercy, which is a shame as she too leads to big moments with sleep and nano boost. Of course, there have been complaints about the balance of Mercy since her rework started, with the the loudest voices alternately decrying her as useless and claiming she’s the only character that matters. 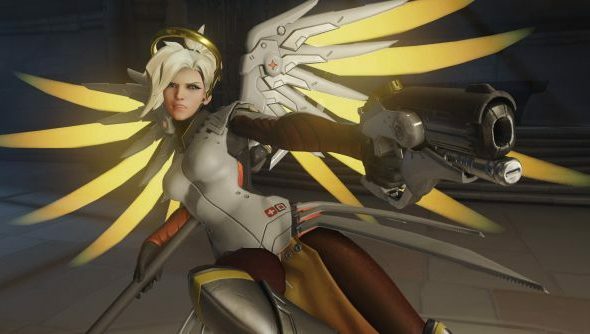 While 1.16 is the patch planned for use at the World Cup, that doesn’t mean Blizzard can’t make a last minute choice to change something, or the esports team could ban Mercy from being selected. That would be a first, however, and not a precedent they will want to set. Given the games still do have plenty of action, it seems unlikely, and we’ll have to wait and see how the games shake out.